After failing to move into sole possession of first place in the tightly packed Northwest Division, the Calgary Flames hope to take advantage of the lowly Atlanta Thrashers on Thursday night when they visit them for the first time in more than five years. The Flames (36-24-10) are tied atop the Northwest with Colorado. Those two teams lead Minnesota by one point and Vancouver by two, and every team has 12 games remaining but the Avalanche, who have 11 left. Calgary failed to create some separation Wednesday, when it opened a four-game road trip by losing 3-2 at Washington, the Flames' second loss in three games, after Alexander Ovechkin scored the game-winner with 1:54 left. "I thought in the third period, when we knew it was going to be right there, they pushed harder than we did but we also gave them the puck all over the ice," said Flames captain Jarome Iginla, whose team was outshot 8-2 the final 20 minutes. "It's pretty nice to play that way, when the other team just keeps giving it back to you." 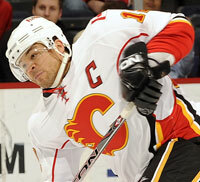 Iginla - third in the NHL with 42 goals and fourth with 82 points - has been terrific in the last two games, scoring two goals and assisting on three more. The All-Star left wing hopes to continue that strong play at Atlanta (30-33-8), where he has only one assist in four contests. The Flames, though, haven't visited Philips Arena since a 2-1 loss on Nov. 11, 2002, and is 0-3-0 with a tie in four all-time games at Atlanta. However, they have won the last two meetings overall, including a 4-1 victory last season. 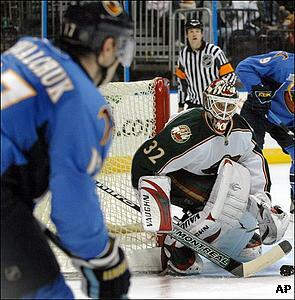 Miikka Kiprusoff, who had 31 saves Wednesday, allowed three goals in those two wins against the Thrashers. The goaltender, though, has been inconsistent in his last six road starts, getting pulled from two of them while going 2-4-0 with a 3.43 GAA. The Thrashers have the third-fewest points in the NHL, and are 1-6-4 in their last 11 games following a 5-2 loss Tuesday to the Avalanche. "It shouldn't be a problem getting up for games, but for some reason this is the first one we've had like that," Thrashers coach Don Waddell said. "So let's hope we can blow by it pretty quickly as we (started) a stretch drive of seven games in 11 nights. It's going to be a long 11 nights if we give those kind of 60 minutes." Ilya Kovalchuk, second in the league with 45 goals and the team-leader with 76 points, is also looking for a better showing after being held pointless with only one shot Tuesday. That performance came after he had three goals and two assists in the previous three games. The All-Star left wing has two goals and one assist in his last three games against Calgary. Kari Lehtonen - the likely starter in goal - hasn't won since making 39 saves in a 3-2 shootout victory over Washington on Feb. 13. He's 0-5-3 with a 4.03 GAA in eight starts since, but managed to stop all six shots in relief Tuesday after Johan Hedberg yielded five goals on 23 shots in two periods before being pulled.